The Council’s new recycling scheme is proving a success after the amount of recycling collected from residents has increased, and positive feedback comes in from the local community. The scheme, which launched on Monday June 3, asks residents to put all their recycling into one green lidded bin rather than separating into different boxes. 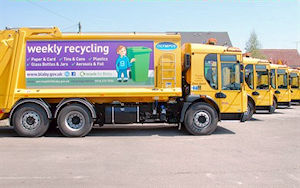 Recycling collections have also increased from fortnightly to weekly. Around 400 tonnes of mixed recyclate has been collected over the first two weeks, which is over 30 tonnes more than the same fortnight last year. Contamination of bins has been low, with the main contaminants being green waste, textiles and small electrical equipment. Residents are asked to use the garden waste bins for green waste or take to the tip. Textiles and small electrical equipment are to be put in the Mind bag and put out alongside the green lidded recycling bin for collection by Mind. Residents that have not had their old unwanted recycling boxes collected are asked to put them out on their normal collection, a crew will be travelling around the district collecting up those boxes. For more information visit www.blaby.gov.uk , email env.health@blaby.gov.uk or call 0116 272 7555.